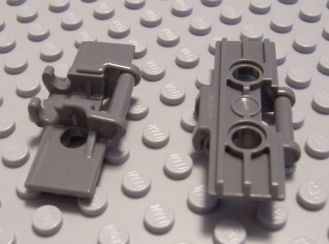 According to a post at nxtasy.org we will likely get the new TECHNIC wide link treads also in black color, with a 2nd half 2008 LEGO set! 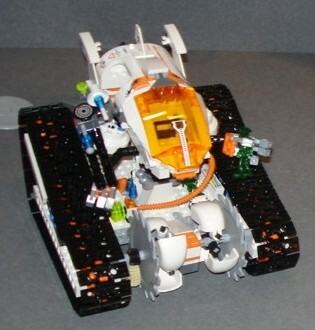 This will probably happen for a non TECHNIC set (7645, MT-61 Crystal Reaper from Mars Mission theme). The initial prototype did not have them in black, but the final version most likely will, according to the same source. Great it would be if LEGO also design some small rubber fits, for the new tread holes, so they could get better adherence at some floor types (like vitrified mosaic). This would be a nice addition for motorized treaded models like the Bulldozer (8275). See them, in a picture from 7645, taken at Toy Fair 2008 (New York). I like the buckets in front of this rover... might be interesting for GBC! To be honest, I am glad the excavators tracks are dark bluish gray, as it makes them easy to combine with 8275's. I will not use these tracks much however, as they have such a minute amount of traction. If someone were to release rubber attachments for the tracks, I would buy at least 300, as then I will be able to make HUGE track vehicles that have good traction. If Lego doesn't make them, perhaps iLegos should? Connect a Technic Brick 1 x 4 with Holes and Bumper Holder to a track link via two Technic Pins 3/4, add a Technic Bumper 2 x 4 Rubber, and repeat for each link. As Mauricio told me, he is working on a rubber feet solution for treads. I'll post news here, when the time arrives. I have a non-LEGO solution using small rubber bands. If the rubber bands are uses in all treads, extra care in their placemente have to be taken, in order to avoid the rubber bands in one tread be place directly in font of the other, between treads, as that would force a 2 rubbber band thikness between them. So they should be suited in some sort of "V" shape. Yes, I've noticed yesterday before your comment here and added immediately a new post about. It was very good idea, yours!